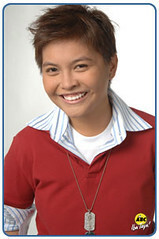 Please vote for Pow Chavez to be the first Philippine Idol. My three-year-old nephew Miguel would be really disappointed if she gets voted off in the next eliminations. She’s got a really beautiful voice and Mr. C even predicted she’d be the first Philippine Idol. Just type POW and send to 2339. But do this on Sunday within two hours after the performances or else your votes won’t be counted.